I should've used smaller dots. I should've waited longer before applying top coat. I should've had more patience. But I didn't, and this is what I ended up with. Clean white nails and streaky black dots. I let the dots set for a good 10 minutes before I put on clear coat, so, I'm not exactly sure what happened there. Ironically, the one good thing about this challenge, is that if you don't like the mani you've worn that day, you're actually encouraged to change them! So fear not, this dotted streaky mess will become nails inspired by A PATTERN............................................................Tomorrow. 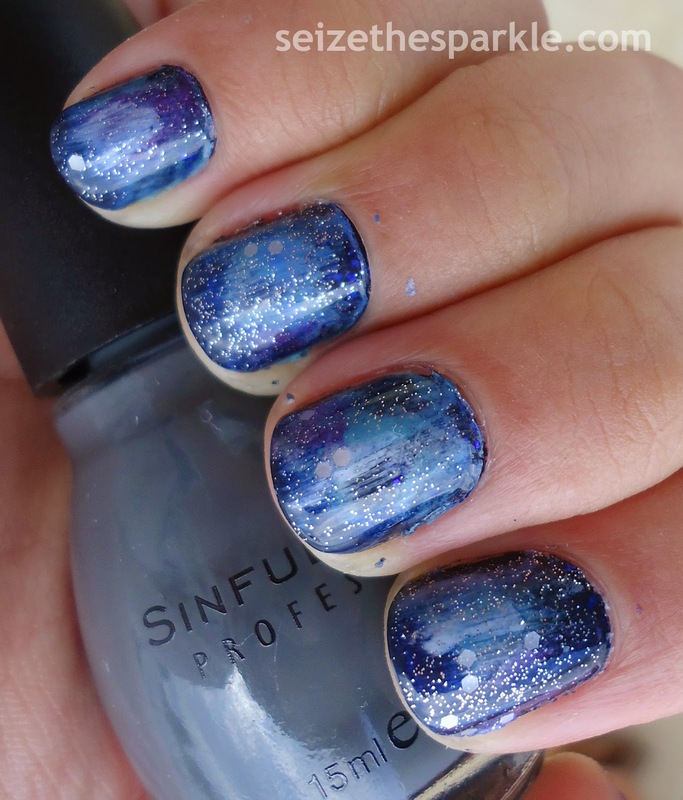 The book that inspired these nails is Uglies by Scott Westerfeld. It's the first book in the Uglies Series, and if you like dystopian young adult fiction, you'll LOVE it. Even if you're not a fantasy young adult fan... give it a try. It's such a great series, and it's really well written. So... what exactly from Uglies made it on to my nails? Let's start with the opening line of the book... hands down, thee best opening line EVER. "The early summer sky was the color of cat vomit." If that doesn't make you want to read on, I don't know WHAT would. So... salmon/coral sunrise nails done using the saran wrap technique on my left pinky and middle fingers, and my right pointer and pinky fingers. Moving left to right, (because that is the direction in which we read...) a gold heart. Specifically, the heart locket Tally wears around her neck as she journeys to The Smoke. I used a dotting tool to create this, so don't think I got super fancy with a brush or anything! Next up... my attempt at freehanding a white tiger orchid. I'm not an artist by any means, so this was really the best I can do. I'm honestly so proud that I was kind of able to draw it with both hands, but obviously the one drawn with my right hand is sooooo much better! Lastly, and I know... it looks a little more like a blackened out fire, or some kind of dead bush, but it's supposed to represent the home of the resistance... The Smoke. I did mention that I'm not an artist right? I wasn't kidding one little bit, promise! For the next prompt, I honestly have no idea what I'm going to do. Your guess is as good as mine, but next up in the challenge is No. 25... nails inspired by FASHION! The odds are definitely in my favor today... so much so, that I don't really want to take this manicure off tonight! Saying goodbye to my song nails wasn't hard at all last night. But these? I've been wanting to replicate Effie Trinket's reaping nails for so long! Here they are... nails inspired by A MOVIE! Finally! 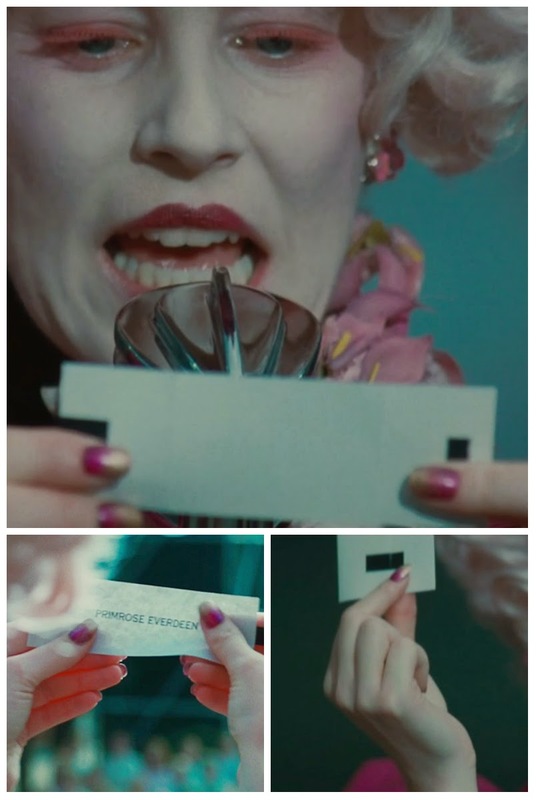 I've been wanting to paint my nails like Effie's for a long time, but for whatever reason, I just never got a round to it. But with a little help from the 31 Day Challenge? Done. These nails are actually really simple. You don't even need to add glitter to achieve the same look, but we all know that I've got serious glitter issues. Sooooo... rather than just pink and gold, we've got pink and gold with gold and silver glitter and 18K gold flakes. And about those 18K flakes... I popped into TJ Maxx the other day, and scooped up 3 bottles of SOPI It's Real 18K Gold Top Coat for $2.99 a bottle along with a really pretty scarf! 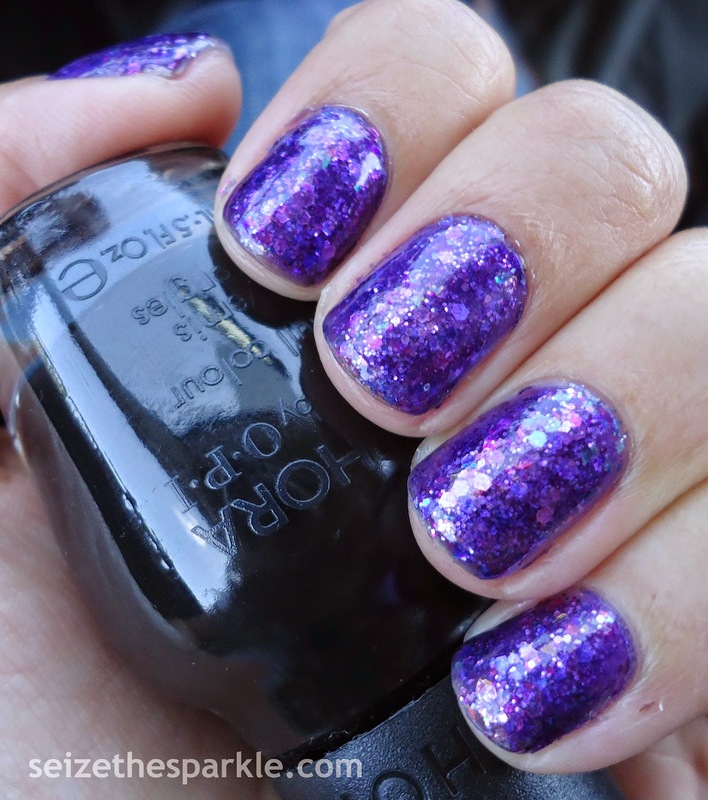 I have been searching for this polish for almost a year, and finally found it!!! After the past couple of manicures were so involved, I needed a little simplicity. 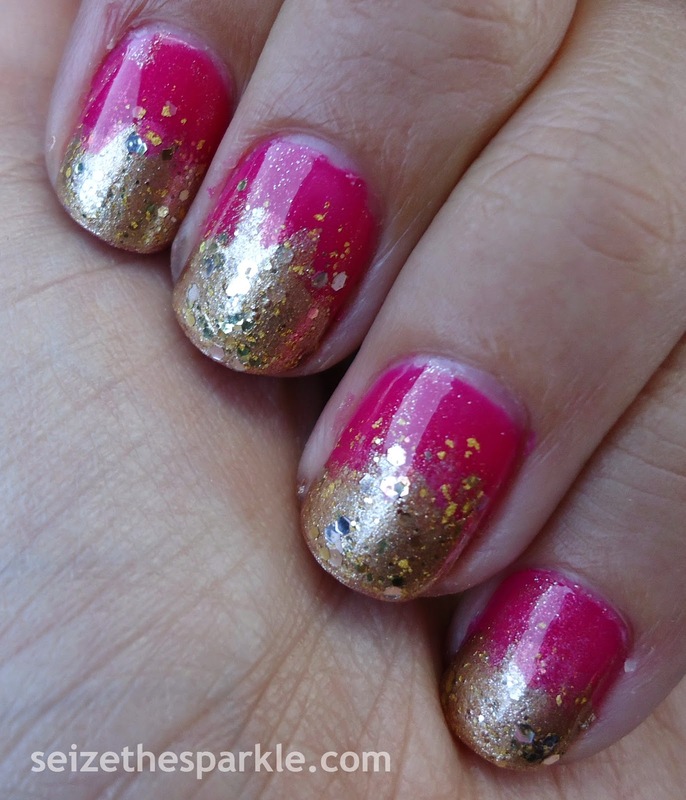 The glitter gradient came to me at the last possible moment, when I remembered that I hadn't swatched any polishes from Rainbow Honey's September Mystery Bag. Sugarberries matched up with So Berry On Trend too well to pass up the opportunity for a little more sparkle. Thankfully, I have more ideas for the prompts coming up than I did for a lot of the past ones combined. Here's to hoping that's a good thing! 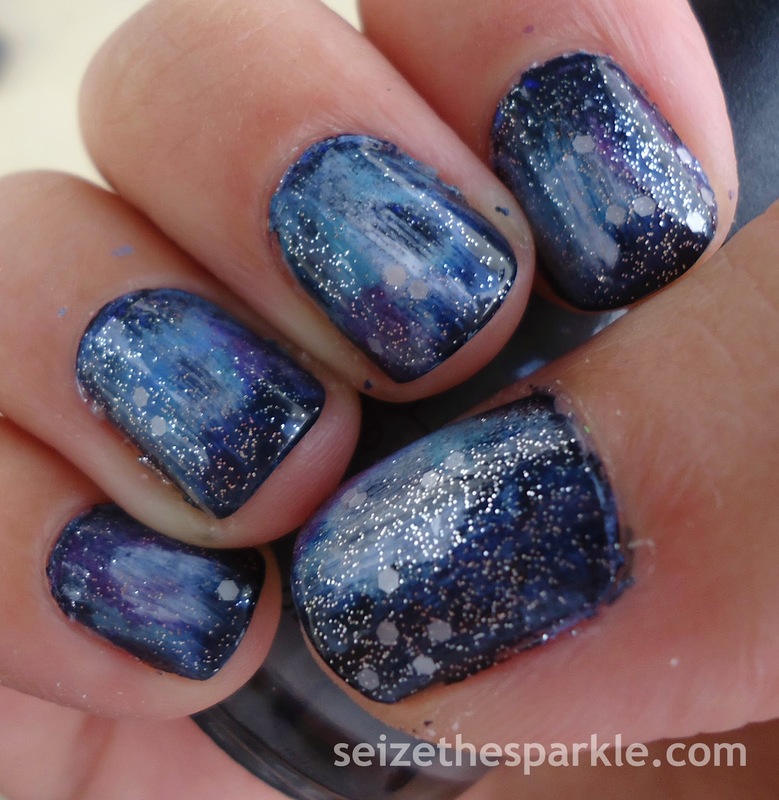 Either way, next prompt up... nails inspired by A SONG... coming soon to this blog right here! What. A. Mess. 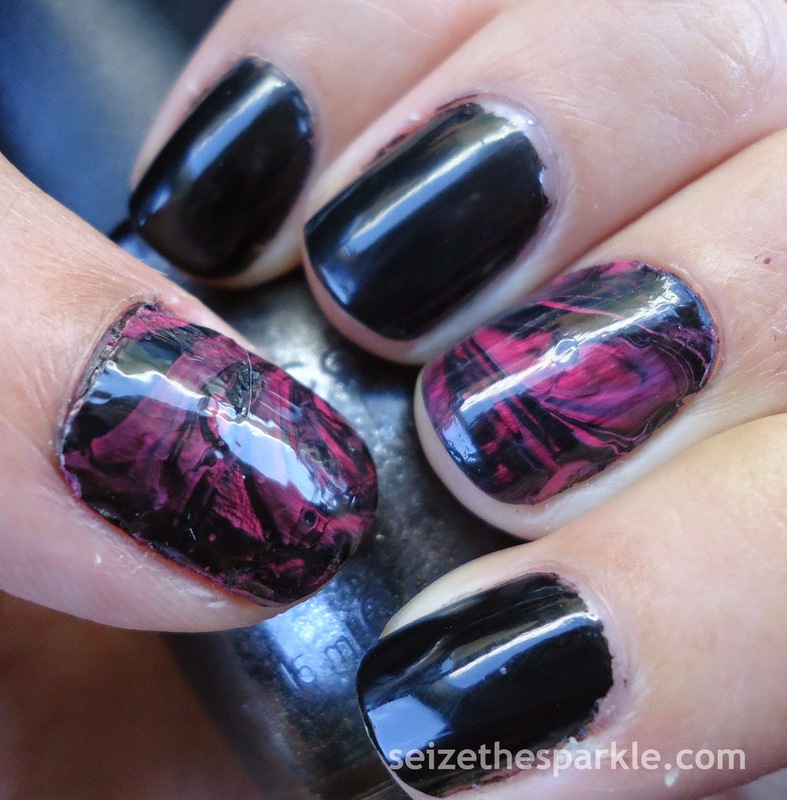 That's how I'd sum up the whole process that is the Water Marble manicure. It's a complete and total mess. A cool looking mess, sure... but a mess, none the less! That being said... for my first time, (and an attempt that wasn't in my native nail lab...) this turned out pretty well. I think the effect looks really cool, and I know with more practice I would get better at it. But, truthfully? I can't really say that I want to get better at it. It's just soooooooo messy. Cleanup took quite a while, immediately after painting last night, and even this morning. I was sure my hands were going to be stuck to my sheets when I woke up, but thankfully that didn't happen! Now that the messy water marble is behind me, it's time to get on to the more abstract part of the challenge... the final stretch that I've been looking forward to! Nails Inspired by A COLOR... But which color should I choose?!? Did I originally promise to complete this challenge in a timely fashion? Because, honestly? It's been really difficult! September has been a crazy month so far. 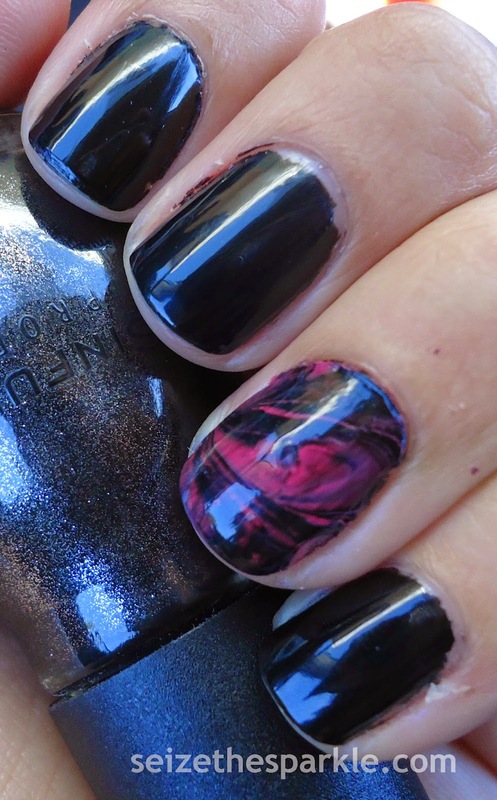 I had very little ambition to paint my nails on Sunday night, let alone tackle the dreaded water marble of Day 20. So... I just decided to wear this one for a 2nd day. Then, I completely forgot about posting it until I was mid-manicure last night, and that just was nawt going to happen. 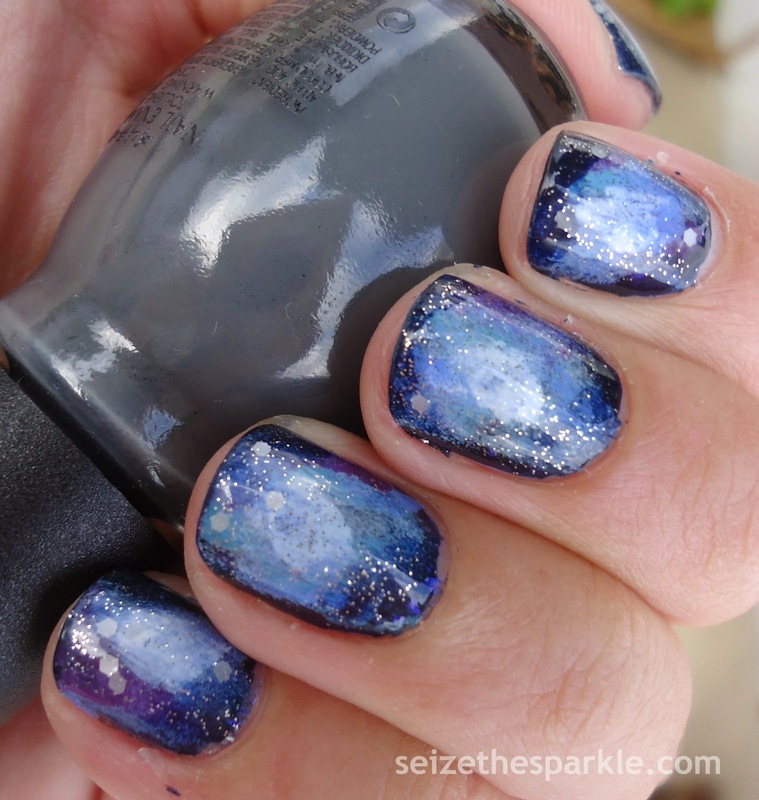 I've never done a galaxy manicure before, but I've used the sponging technique before on some of my gradient manis. I started with a base of navy blue, then sponged on white, light blue, light green, and purple to create the galaxy effect. I did get a little carried away with the lighter colors, so I had to add in some navy blue and black for balance. 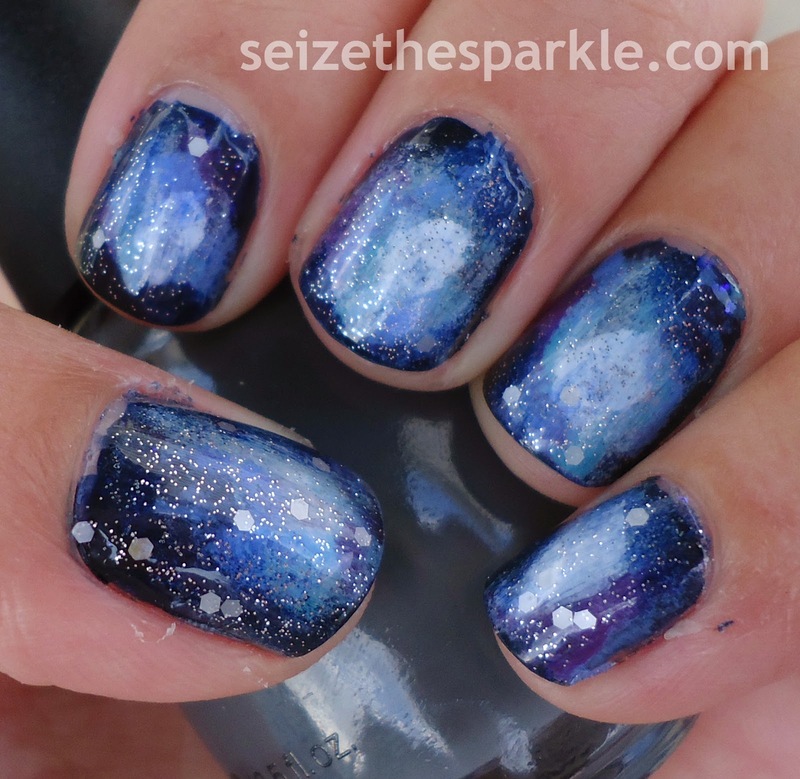 I topped that with a coat of clear to blend my galaxies together, then added a coat of Pirouette My Whistle for a sparkly star effect. I really didn't want to take this mani off last night. However, I know that the sooner I can get over the hurdle that is the WATER MARBLE... the oh so very much better, Better, BETTER! Moving on from glitter was definitely hard. I could've worn that mani for a lot longer. BUT... the challenge goes on, and I'm already 2 days behind... so, here we are with HALF MOONS for Day 18 on what's supposed to be Day 20 of the #31DC2014. 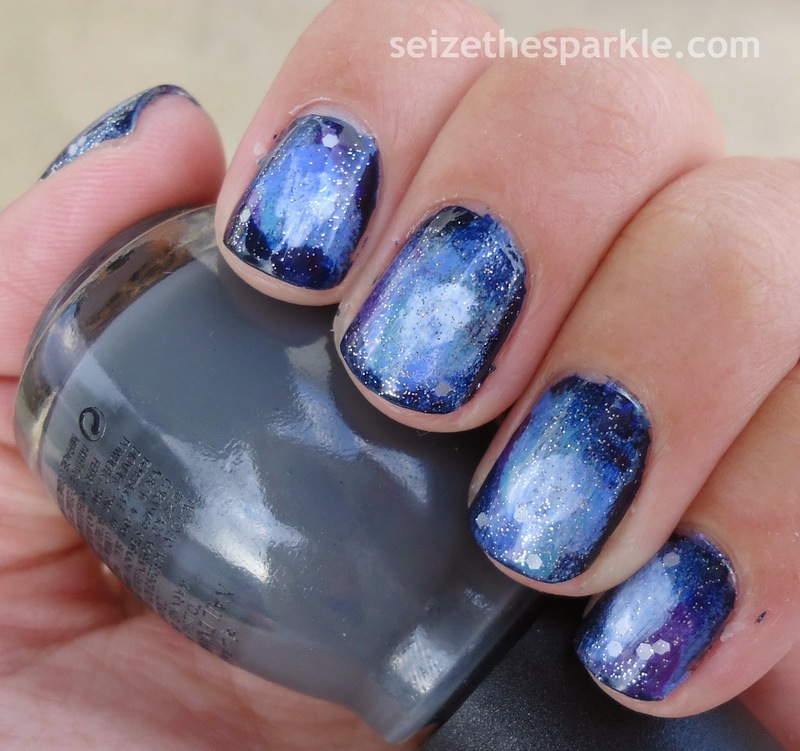 2 Coats Sally Hansen Jell-ous? I'm seriously loving this manicure, so much so, that I'm sad to take it off. 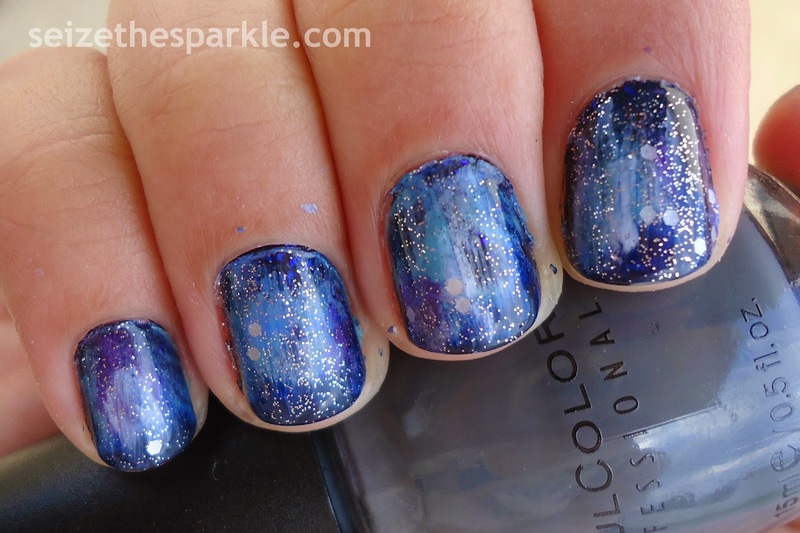 I'm definitely going to have to try another half-moon mani in the the future. Hard to believe this was my first one! To create my half-moons, I used binder reinforcement stickers. 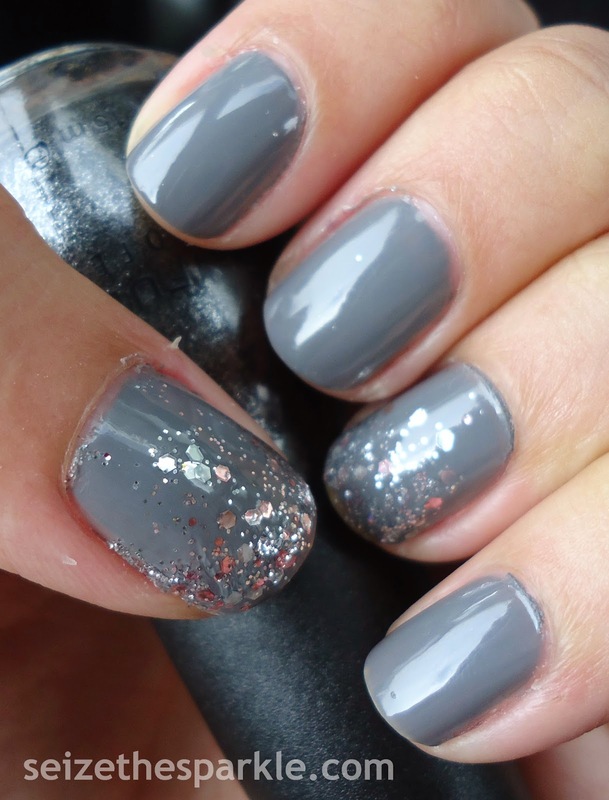 I painted on 3 coats of Smokin'... a charcoal gray creme polish. Varying between coats of Jell-ous, a sheer pink jelly, and Grape Jelly, a sheer jelly purple polish, The gray turned into more of purple, while the negative space half-moons took on a sheer rosy pink. At that point, my nails were pretty, but they were definitely missing something. So, I added a coat of Pirouette My Whistle for a touch of glitter. 2 more coats of Jell-ous on top of that, and I was ready for a thick coat of Seche Vite to start the drying process. As much as I like how my half-moon manicure turned out... I'm really anxious for the next prompt. GALAXIES... here I come!